Under the agreement reached in Geneva over the weekend, Iran is permitted to keep one-half of the uranium it has enriched to the 20% level, and is required to dilute the remaining one-half to 5% U-235. It is allowed to continue enriching uranium, but agrees not to take that process beyond 5% U-235 during the next six months. No doubt many people who hear about those terms will be reassured, thinking that 5% enrichment, and even 20%, represents only a small percentage of the total effort needed to create the materials for a nuclear bomb. Unfortunately, this is not the case. Approximately 15 – 25 kilograms (33 – 55 lbs.) of 90% enriched uranium is required for a Hiroshima type bomb (15 – 20 kilotons). It is about the size of a grapefruit or a softball and a U-235 implosion bomb gun-type fission device is so simple it does not require testing. Despite not being an efficient military weapon it is an ideal terrorist device. 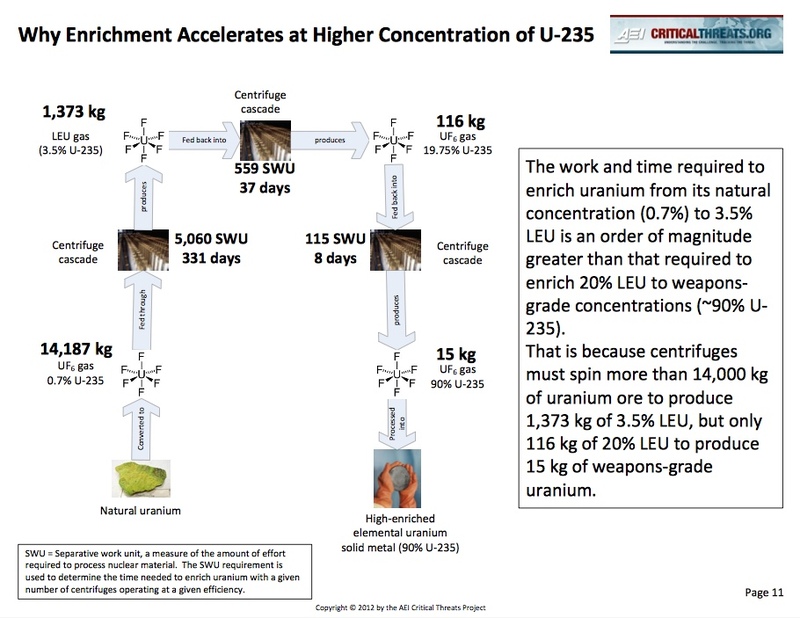 The work and time required to enrich uranium from its natural concentration (0.7%) to 3.5% low-enriched uranium (LEU) is an order of magnitude greater than that required to enrich 20% LEU to weapons-grade concentrations (90% U-235). That is because centrifuges must spin more than 14,000 kg of uranium ore to produce 1,373 kg of 3.5% LEU, but only 116 kg of 20% LEU to produce 15 kg of weapons-grade uranium. We ought to look at this agreement very carefully and not be misled by the apparently low levels of enrichment permitted, because the effort required is so dramatically non-linear. It takes about 8 days and only 2% of the total effort to go from the 20% HEU permitted to the 90% required for weapons grade and only 45 days and 10% of the cumulative effort from the 5% level of HEU.